This is the Foundation’s own project. It is situated in Vatara, Dhaka and running since 5th July, 2017. 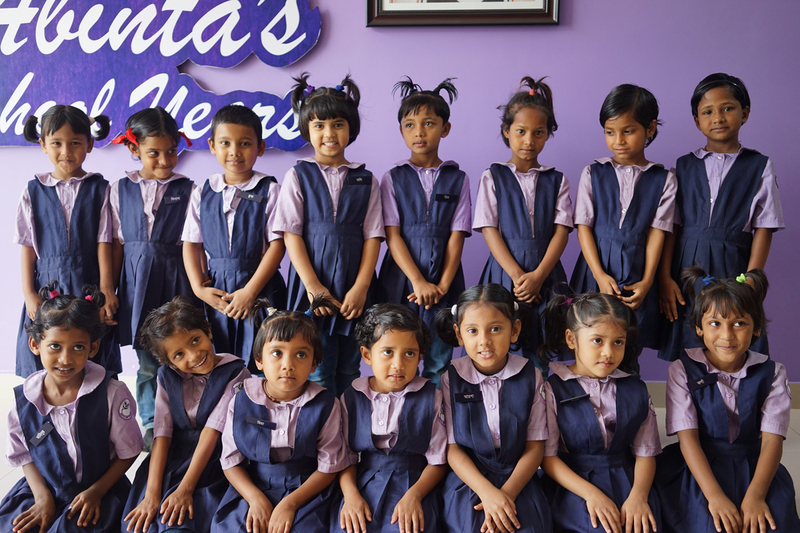 To honour and realise Abinta’s dream to ensure education for all – AKF designed this particular project. This education programme was composed to provide students all-inclusive curriculums to not only make the students excel in their studies but also to develop them as critical thinkers and future ‘philanthropists’ to be compassionate to plights of other underprivileged children. The education programme is concerned with the holistic development of every child’s intellectual, emotional, social, physical, artistic and creative potentials. 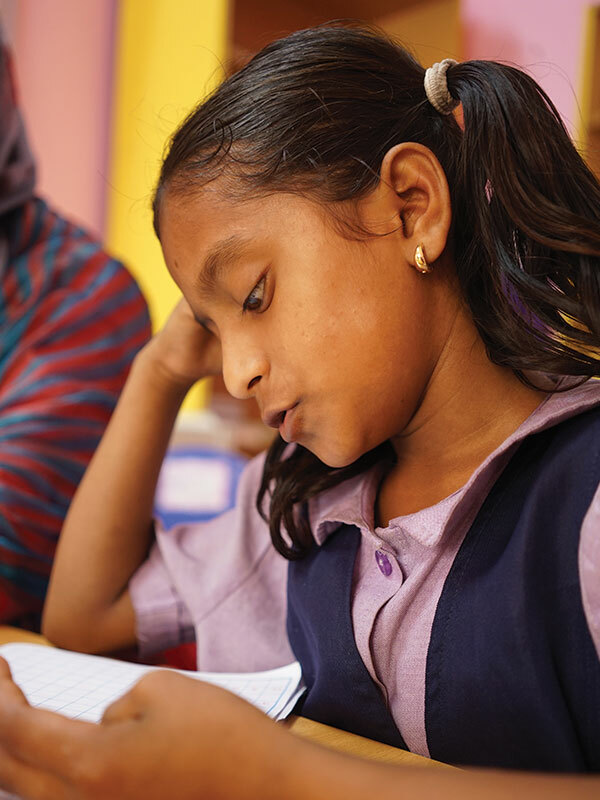 AKF believes every child should have the ability to make her/himself empowered to decide on their futures. Hence the School has designed their curriculum keeping in mind the values Abinta herself stood by all through her life. The school’s child-friendly learning environment has been designed with a lot of care, to provide a joyful school atmosphere. The teachers are constantly pushed to develop their teaching-learning techniques in order to keep up to the 21st century’s demands. The supreme aim is to empower the students with necessary tools and skills so that they can break out of the cycle of poverty, and to lead a life of respect and self-worth in ‘not-too-far’ a future. The school follows the national curriculum with strong emphasis on English, Maths and Technological Education. AKF School, however, adapted the existing NCTB to make it functional and related to real life experiences. Teachers are encouraged to use interactive and participatory teaching-learning methods by imparting lessons through student-centred and data-driven teaching methodologies and employing best practices; introduce English as a communication medium; and be more proactive in engaging students in various extracurricular activities. Sports days, art and craft fairs, inter-school art competitions, etc. – are regularly organised to boost students’ morale. Because of the size of the class (each class has 16 students) – the teachers spend healthy amount of time with each students. The class timings are: pre-kinder and kinder- 20 minutes per lesson; class-I and class-II – 40 minutes per lesson. The class follows an interactive style of learning, where students are encouraged to ask questions or air their opinion on specific topics; this in turn, builds students’ confidence and ability to communicate boldly and openly. The students’ progresses are recorded in detail in a report card which is shared with the parents. The students pay a minimum of BDT Tk. 10 (US$ 0.13 cents) as a token tuition fee per month. This money is collected as ‘admission fee’ for 2019. In addition to teaching students benefits of saving, this initiative has been undertaken to instill accountability and responsibility for their children’s education within parents. The school boasts a fully equipped play and multi-media room and a library consisting over 3,000 story books, both in Bengali and English – sourced locally and from abroad. They also provide school bags, uniforms, shoes and sweaters as well as all necessary educational materials (textbooks, workbooks, notebooks and take home diaries) plus a range of stationeries and learning materials for in-class use for the students. The students also get nutritious meals and monthly free health check-ups. School also provides professional development in-house trainings for teachers. Periodic field trips and outings are also organised. Monthly parent-teachers meetings are also an important and absolute necessary part of the project. AKF puts extra emphasis activities those would induce desire and effort to learn. They also observe special occasions and special days; such as the Bengali New Year or ‘Pohela Boishakh’, which is celebrated on 14th of April every calendar year. The school organised their Boishakh programme on 12th of April (14th is a national holiday). A grand Boishakhi Utshob(New Year festivities) was celebrated in the school premise, with a cultural show and a fund-raising mela (fair). The cultural show included dance performances, songs, poetry recitations, dramas and a heritage fashion show. The fundraising mela included pithas(a traditional Bengali-style cake) and handicrafts made by mothers of the student. There were stationary items, cards, flowers, wind chimes made by the teachers and students. All were crafted using recyclable materials. This is organised particularly with the aim to encourage students to prepare home works as well as extra lessons in English and Maths. Students from impoverished families often do not get adequate support and inspiration to do ‘school works’ once they go back home. Due to circumstances, parents or siblings and many times the students themselves have to get involved in day to day struggle to meet their basic needs. In the hullabaloo, home works do not get due priority. AKF is striving to improve this particular situation. Hence this extra day at school where students can continue to learn. In these sessions, students not only do their homeworks and extra lessons in English and Maths, but also get involved in religious studies, classes on arts and crafts, music lessons and book reading.Issue based dramas are periodically performed. Self-defence classes are also organised to provide basic self-defence skills. Educational and child-friendly videos are periodically shown at the School’s multi-media room. This is again an experimental pilot scheme of AKF School, where senior citizens are invited to simply ‘chat’ with the students. These sessions are ways to build bridges between two generations – older generation to enjoy ‘fun-time’ with the younger generation and the young ones learn important life lessons from elders’ real-life experiences. The students choose a book to read and the guests tell them their life experiences related to that particular book. These kind of interactive sessions encourage children to learn in a fun environment and also give them an opportunity to experience ‘family time’ out of their homes. AKF believes in holistic education; hence they put extra effort in involving parents in their children’s lives. It is often noticed that in impoverished families, bread-winners are so busy to provide food for their children education usually takes a back seat. To change that mindset, AKF designs these meetings in way that the parents are encouraged to get involved in their children’s school life. Apart from sharing their children’s educational prowess, they are also given information on issues related importance of education – particularly for girls, basic health and hygiene, awareness on gender situation, etc. These meetings will also provide a platform to raise problems/issues relating to parenting skill. Students will be encouraged to be empathetic and supportive to their mothers’ plights and appreciate their relentless struggle to make their children’s future with possibilities. Their ‘role models’ – their own mothers’ contribution to their overall development would be highlighted. PRAN Bangladesh : The school’s main breakfast items for the students are purchased from PRAN at a discounted rate. Teach For Bangladesh: A Fellow is recruited for 2018-2019, who is working as a full-time teacher in the AKF School, with the aim of changing the academic trajectory of the students. Sun Healthcare Foundation: A team of medical doctors conduct free monthly health check-ups of students, and also provide other health services to the students and their families all year round at a discount. Frobel Academy (Chittagong): They provided teachers’ training (2 teachers for 2 days) and offered a 25% discount for future training events. The workshops titled, ‘Play and Learn’ where teachers were trained by a highly accomplished trainer, Ms Lucy Bowen (Maters in Science for UK) who used ‘Play Therapy’ as a teaching method particularly for pre-primary students. Faculty of Fine Art, Dhaka University: Some of the Faculty of Fine Art students helped the students of the AKF School to paint a wall mural at the school. International School Dhaka (ISD): The AKF School students participated in an ‘Up-cycling project’ organised by ISD where they learnt how to utilise waste materials for up-cycling. Students of ISD, in turn, participated in the inter-school art competition organised by the Abinta Gallery of Fine Arts. They also volunteered at the Abinta build and the series build project jointly organised by AKF and Habitat for Humanity Bangladesh. They also volunteered to renovate the extended part of our School in Vatara. Scholastica Junior Section School, Gulshan-2: AKF School students were invited to participate at the sports day. Scholastica students also participated in the inter-school art competition organized by Abinta Gallery of Fine Arts. Light of Hope: They share a shelf for a whole day in their library for the Foundation staff to have experience how to ‘run’ a library. AKF also purchased a collection of storybooks from them. Marks and Spencer: The AKF School organised a fun-filled one day project – ‘Secret Santa’- where 80 senior officials along with the Country Director distributed gifts and food items among the students. PolliKallyanShikha Society (PKSS) has a long history of providing free education to underprivileged children in Natore district. They took part in the Foundation’s inaugural ceremony. Later their representative approached with the idea of a partnership under the Education Support Programme (ESP). As a one-year pilot scheme, AKF borrowed from BRAC’s ‘One Room School’ design and went into partnership with PKSS to start five ‘one-room-schools’ (elementary) in areas where the partner organisation was already working. This programme was initiated in February 2017 with five schools in Natore in five villages. These areas are: Joykuri, ParchokHoripur, NingoinGhunpara, NingoinUttarpara and Patkol. AKF provided monetary assistance, including teachers’ salaries, education materials (books, notebooks, stationeries, etc.) – while PKSS was responsible to do all relevant supervision. PKSS was responsible to provide monthly reports on students’ progresses as well as the extent of their families’ involvement in the project. The Bashabo Adarsha Prathomik Bidyaloy, based in BashaboOhab Colony, Plot-142, Block-D, Sabujbag, Dhaka, is running since 1987. The students are from impoverished families living in the surrounding areas. The school was dilapidated and in need of immediate refurbishment. It is imperative to have access to solid and relevant environment for students to gain impactful education. The poorly constructed school was not abetting the befitting environment for learning. AKF went into a contract with the Head Teacher of the school to provide funds which was aimed for infrastructural development. AKF paid additionally to cover the cost of a total number of 4 teachers, 1 Head teacher, 1 admin assistant and 1 caregiver. There were a total of 138 students between Kindergartens up to Class V who benefited from this scheme. There were a significant number of absentees in the report submitted by the project supervisor. The three months (August-October, 2017) reflects that only 68 out of 138 students attended classes regularly and a major percentage (55%) of students did not show up at all. This happened due to closure of school for refurbishments. The attendance however was regular at the newly constructed school. AKF provided all inclusive and building expenses for this particular school. A plaque with the Foundation’s name and logo was planted at the school premises on 3rd May, 2018. Faria graduated from the North South University with a degree in Marketing. She started her career by interning at a renowned corporation but soon realised her calling is not in a corporate world. She strongly believes that education and eradicating inequality in education are the driving factors in developing a country’s profile and through involving as a professional in the education sector she can contribute in the vision of change. Thus she joined Sir John Wilson school and worked there as a teacher for a year. 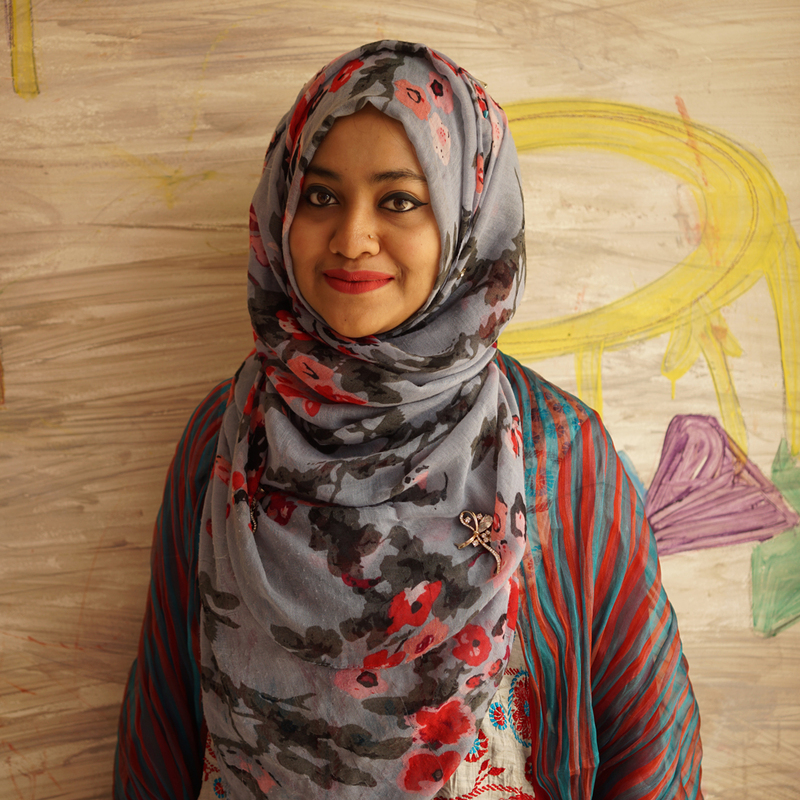 As a Fellow of the Teach for Bangladesh, she is currently in the process of finishing her postgraduate course at the BRAC Institute of Educational Development. She started working at the Abinta Kabir Foundation School in January, 2018 as a Teach for Bangladesh Fellow. Her involvement as a Fellow and a teacher at the school encouraged her to create an engaging and interactive teaching-learning experience for the students. She firmly believes that by building strong character traits – resilience, optimism, collaboration, etc.- in students and providing them with a sense of security through stable relationship with at least one adult can create winners and achievers. The students at the school mostly have fluid support systems at home due to economic situations and hard working parents blossoms with constant and positive support – she opined. She often visits the students and their parents in their community outside school hours. Sometimes she and the students sit in a circle – ‘learning circle’ – where they chat about everything and anything; this in turn, makes the bond between the her and her students stronger. The affinity she feels with the philosophy of the school and its founder, Abinta herself – makes her work very enjoyable. Long working hours and struggle to strategically manage her workload, which includes instructional time spent in the classrooms as well as time spent on extra tutoring, lesson planning, grading, data entry and analysis, also training for further development can be challenging sometimes, but the end results – the bright smiling faces of the students with shiny eyes looking towards an equally bright future makes it worth the effort. Her past experience as a volunteer working with various NGOs pushed her hard to realise her dream of working with children who come from impoverished families by providing them support and tools to become exceptional citizens in future – who are able to take critical life decisions. She will continue to work in sectors where she gets opportunities to work closely with low income families and communities to help them work towards realising their dreams of better futures.